At least nine people have been killed, including two suspected suicide bombers, in two blasts at luxury hotels in the Indonesian capital Jakarta. One explosion hit the Ritz-Carlton, ripping off its facade, and the other the JW Marriott. As many as 50 people were hurt, including many foreigners. At least one attacker was a guest at the JW Marriott, police said. President Susilo Bambang Yudhoyono has visited the scene and condemned “the cruel and inhuman attack”. No group has yet claimed responsibility for the blasts. One foreign national has been confirmed dead – a New Zealander. Indonesia suffered a number of bomb attacks – mainly linked to the militant group Jemaah Islamiah – in the first years of the century, but has since been praised for its campaigns against militants. President Yudhoyono said Friday’s attacks were carried out by a suspected terrorist group, though he said it was “too early to say” if Jemaah Islamiah was involved. He added: “Those who carried out this attack and those who planned it will be arrested and tried according to the law. The attacks, with homemade bombs, were on the basement car park of the Marriott and a restaurant in the Ritz-Carlton, police said. Police said that two suicide bombers were involved, and at least one attacker, and possibly more, was staying at the Marriott. An unexploded bomb and other explosives material were found in room 1808, which officials said was the “control centre” of the attacks. Gen Wahyono said a suicide bomber was suspected of carrying out the car park attack as a severed head was found there. It was a scene of confusion and chaos outside the Ritz Carlton and JW Marriott hotels this morning. Ambulances and security forces arriving at the hotels came to rescue the injured and treat anyone who was hurt. People milled around outside, onlookers wondering what had happened as hotel staff and guests stood around shocked on the streets. The blasts took place at breakfast time in one of the most prestigious areas in Jakarta’s commercial centre. Many Indonesians we spoke to this morning told us how shocked and upset they were by what had happened here today and how worried they are about the damage this will do to the reputation of their country. New Zealand’s Prime Minister John Key confirmed a New Zealand national was among the dead. Reuters news agency named him as Tim Mackay, president director of PT Holcim Indonesia, quoting the company’s marketing director Patrick Walser. Australian Prime Minister Kevin Rudd condemned the attacks as “barbaric”. He said he had “grave concerns” for an embassy official and two other missing Australians. US Secretary of State Hillary Clinton said they were “senseless” and that the threat of terrorism remained “very real”. The Manchester United football team was due to arrive in Indonesia on Saturday and was booked to stay at the Ritz-Carlton. The team have now called off the Indonesian leg of their tour, saying they “cannot fulfil the fixture in Jakarta” against an Indonesia Super League XI on 20 July. The two blasts, in Jakarta’s central business district, occurred at about 0730 (0030 GMT). Businessman Geoffrey Head, who was in the Ritz Carlton, told the BBC he did not hear the blast but that his colleagues had called him after it happened to tell him to leave the building. Mr Head said there had been no warning to evacuate the building. “The surreal thing was going down in the elevator and walking through the lobby and looking across to my left and noticing the cafe was completely blown out,” he said. A 50-year-old South Korean man, Cho In-sang, was taken to hospital with minor injuries. “I don’t remember exactly but suddenly the ceiling is falling down and the sound was big,” he said. Consular staff are trying to track their nationals, and Australia issued a warning against unnecessary travel to Indonesia. The country of 240 million people has been praised in recent years for maintaining a pluralist democracy while finding and punishing radical Islamists responsible for a series of bombings more than five years ago. 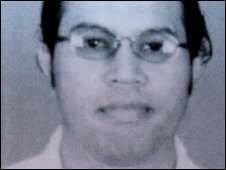 Attacks on two nightclubs in Bali in October 2002 killed 202 people, most of them Australian. Since then, a combination of new laws, anti-terror training, international cooperation and reintegration measures have kept Indonesia peaceful, analysts have said.